They don’t call her the “Grand Inquisitor” for nothing — the headline of a story about her in Smithsonian Magazine. Three of her press passes are on display at the Smithsonian Institution’s National Museum of American History. Helen Thomas, the dean of White House correspondents, has raked U.S. presidents over the coals since John F. Kennedy and has been covering news in Washington since Harry S. Truman. The diminutive indefatigable and modest octogenarian is still at it from the wee hours every day and has left her mark on 20th Century U.S. journalism, where she’s fought many battles to ensure accurate dissemination of news about the country’s chief executives and equal rights for women. 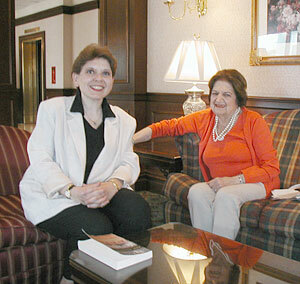 Thomas, whose family hails from Lebanon, very graciously spent quality time with Magda Abu-Fadil, director of LAU’s Institute for Professional Journalists, during the latter’s visit to Washington, D.C. in July 2003 and discussed the current state of the American presidency and the media. Hotel employees and guests where Abu-Fadil was staying came up to Thomas to ask if she was the lady they saw on TV who gave the president a hard time and asked to be photographed with her. In addition to being the first woman White House bureau chief for a major news agency, Thomas was the first female president of the White House Correspondents Association and first woman recipient of the National Press Club’s Fourth Estate Award. She was one of the first women members of that club, blazing the trail for other women journalists like Abu-Fadil, and has served as a role model for generations of reporters. In June 2003 she received an honorary doctorate from the American University of Beirut. Since leaving UPI, Thomas has been a columnist with the Hearst chain of American newspapers.